Overall had a very good experience taking this Japan tour. Was glad to see so many great sights from Tokyo to Takayama. The tour needs individual headsets, everyone cannot always stand in front of the tour guide. She cannot walk and talk at the same time. Wifi was poor. Tour promoted wifi on the bus, but very poor conditions and limited network of people could use it. Apart from that, the sights during the trip were great with an excellent tour guide to teach us about all the spots. 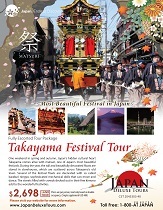 Thank you Japan Deluxe Tours. Several hotels needed minor maintenance - dirty carpets in rooms, dirty group, stains in bathrooms. Staff were excellent in all. Wifi in all rooms would have been better. Our tour guide, Ms. Tanaka was very knowledgeable. She was patient and flexible to the needs of the group. Good variety. We got a good overall view of Japan.